And it looks like another record breaking sunny day today. 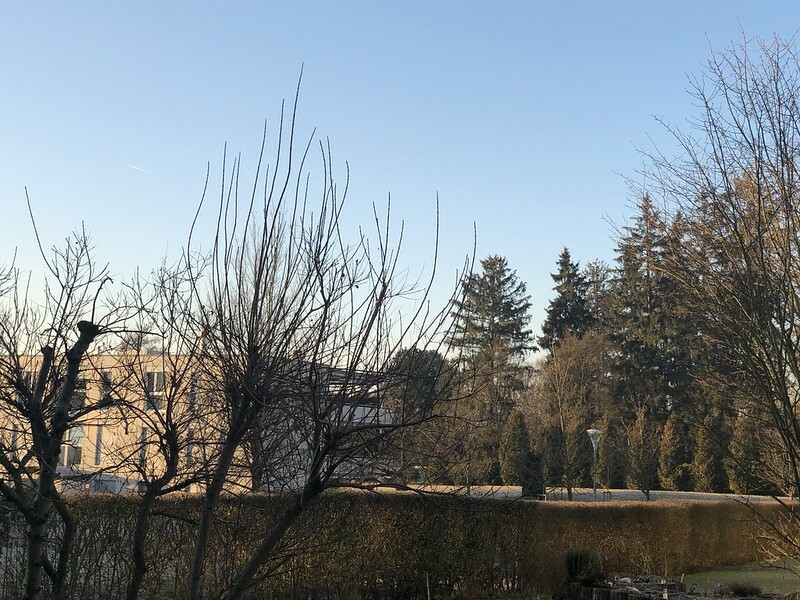 According to a fake newspaper that I have online with its various messages during the day, this months seems to be a record breaking month for all time (how did they work that one out) for temperatures and sunny weather. Mr. Swiss tells me it could change next week, but he is Swiss and they always look on the bright side of dim. All I know is that the mornings are cold, but sunny and the birds are singing there little hearts out. They do not even bother so much with the feeders. Perhaps they are now thinking in terms of nest building. 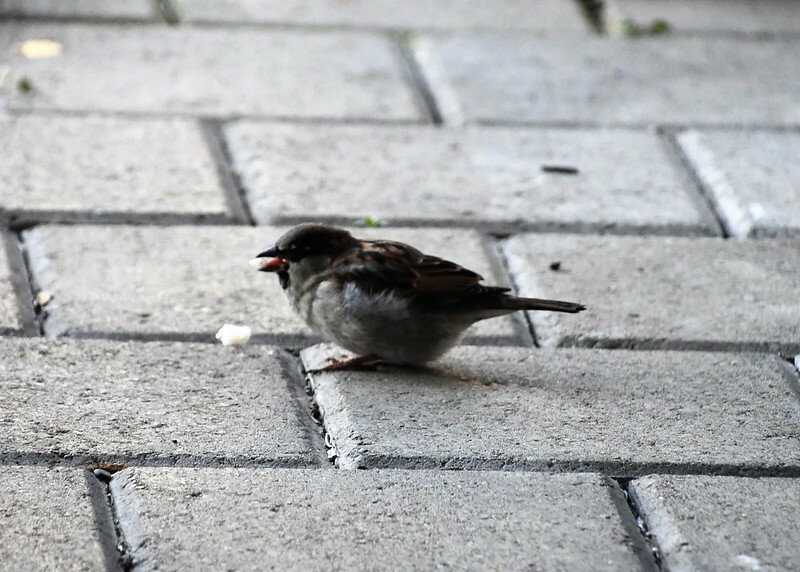 Now and again a sparrow discovers some bread pieces and decides to have a sample. It is so much easier now with my new 300 telescopic zoom lens as I can take the photos in the comfort of the kitchen at the table whilst eating breakfast. The most spectacular capture I got yesterday was my magpie. Every morning he flies over to see what the crows have left and sits patiently in the tree waiting for the opportunity to grab some food. 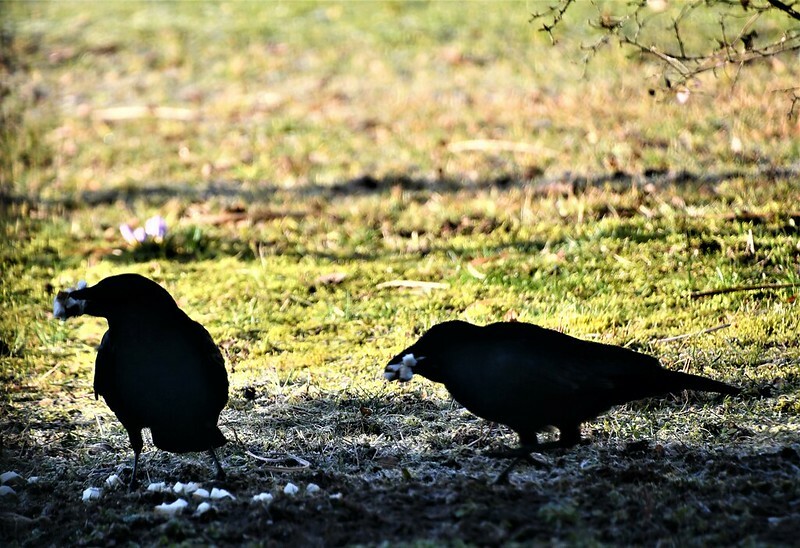 As usual the crows take the first pick with their record breaking beaks full of the offerings of the day. They afterwards fly off, probably to a quiet tree, and make the most of the feast. Yesterday was a bit of a more eventful day as we had a couple of friends visit us. It was such lovely weather that we could sit outside on the porch with our cake and coffee/mineral water and enjoy the afternoon sun. It began to get a little chilly towards 5.00 pm. This weather is really unbelievable at the moment. This week I have no big plans of having to fulfil any special duties. It will be the good old routine and I hope to get out a bit with my new camera. This morning will be shopping and I am not sure about the afternoon. As the Scottish poet Robbie Burns said in a poem “The best laid schemes o’ mice an’ men Gang aft a-gley, meaning often go awry. He seemed to write everything with his Scottish dialect. I am hoping that my week will not gang a-gley and that it will be smooth runnings. Now to the usual routine with a shower and cleaning ritual and then off to the supermarket in my trusty steed. Begin your week well and may it be a good one. If not, then it can always get better. I finish with a Spring greeting from the wilds of Switzerland where the cows and crows say goodnight to each other. 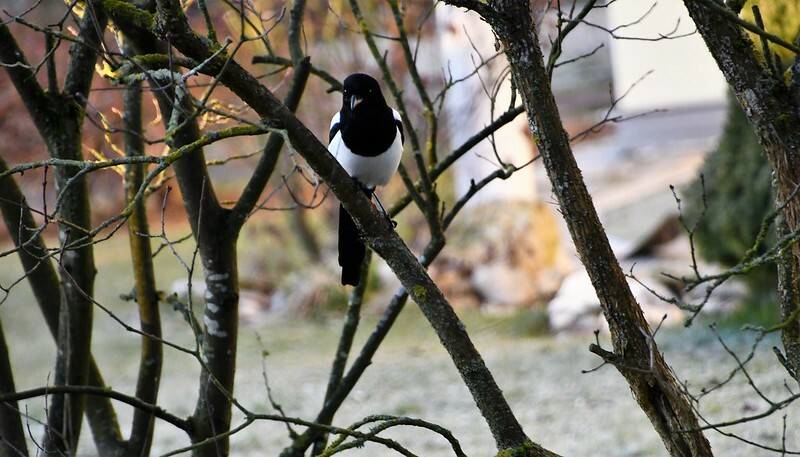 I love the constant chattering of the magpies. They onc be built a nest in the tree opposite. Although they only used it once when it was built, it was there for years afterwards. ‘they always look on the bright side of dim.’—I like this! Yesterday was warm enough that I had our ceiling fan on. Today it is cold and windy. Ceiling fan off. Who knows how it will be later on in the day…. I have been told that when I speak english the word “ja” often slips into the conversation. We get our biggest hits of winter in February and the first half of March. 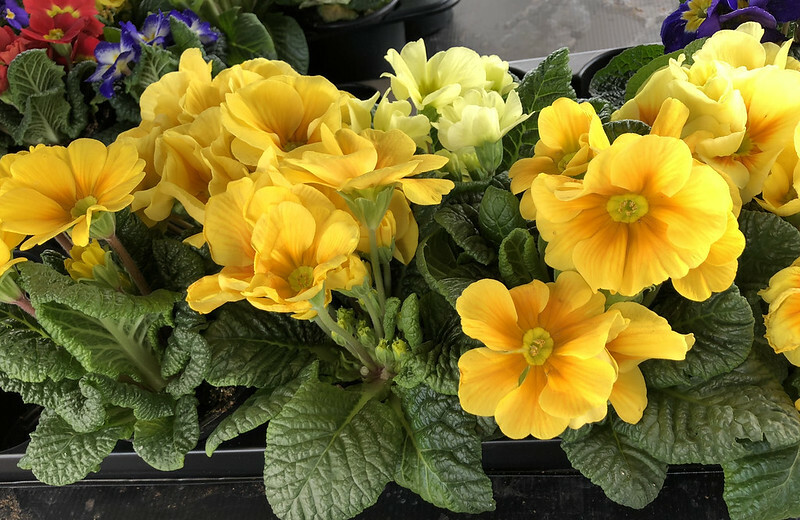 So far, we’ve had the least snow for the season EVER and although there has been some lethally cold weather, we’ve also had spring weather in between. Garry is like Marcel. Until the trees bloom, he’s waiting for The Big Snow. It has been lovely weather here, but I have had no chance to go out and see what nature is doing. I have heard that the forsythia is flowering in some places. Okay, so it was another long day, and I am still behind. I can explain, but it would not be very interesting. It was just a long tedious day. No explanations necessary. I am sure you had a death defying fight with a dodder attack on a tree, or perhaps an infiltration of poison ivy. um . . . yeah . . . .It was just like that!